In 1960 we were still living at 38 McIvor Road. I was attending Gravel Hill State School and was in Grade 3. An impressive red brick building on top of the hill surrounded by giant sugar gums today Gravel Hill School is still much the same, but is occupied by the Salvation Army. When I was in Grade 2 we were in what was called the 'army huts' on the lower ground next to the railway line. Our teacher was Miss Spencer. I shared the center row of desks at the back with Jeanette McWhinny. We learnt exciting things all based on the book exploits of John, Betty and Jane. As a deviation there were the adventures of Noddy and Big Ears to be heard. Much of my school ground time was spent hanging around the old ack ack gun that was in the school playground. The bigger kids used to spend their time, especially on wet days, in the shelter sheds playing 'British Bulldog'. This meant two sides on opposite ends of the shelter sheds; then someone had to run across the open ground whilst the other team tried to 'shirt front' him and knock him over. At lunch time I remember 'half cooked in the sun' cheese and salami sandwiches. Later in Grade 3 the pie van used to arrive at the Mundy St corner. The pies were boiling hot and would burn your tongue if you were too eager to eat them. Sometimes I spent my lunch money on a hot jam donut from the milk bar next to the Brian Boru Hotel in McIvor Road. In 1961, Mum won about 300 pounds in 'Tatts'. 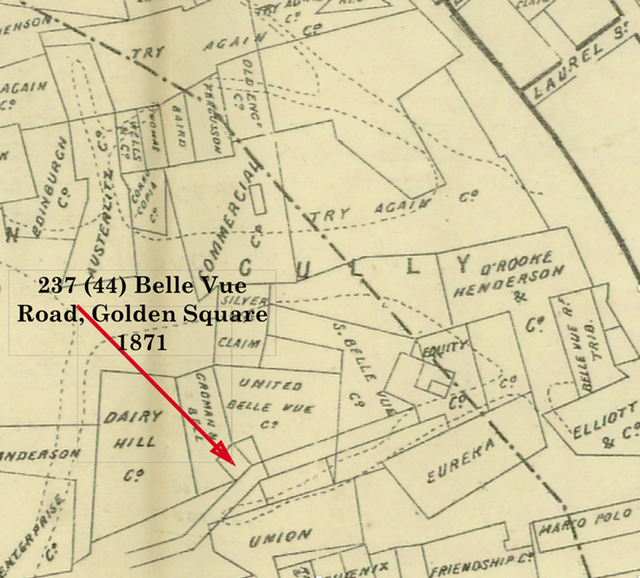 Dad took out a war service loan and built a house at 46 Belle Vue Road, Golden Square, next to my Grand-parents. On the other side of my Grand-parents on the corner of Porter St lived my Uncle Jack and Aunt Phyllis. The house block is long and narrow, backing on to old mining land; and for many years after Mum used to be accosted by a brown or black snake as she walked around the side of the house. She became very adept at disposing of them with the shovel which always resided at the back door. Compared to McIvor Road we thought we were in heaven. We were surrounded by vacant land and mine dumps. We could count 11 poppet heads from our home. Today there is only a couple left. From our front kitchen window we ate lunch and watched people dump their rubbish at the old Bendigo Tip in Thistle Street. I remember the flys were a bit of a problem. We could look out over the CBD until gradually the tip got higher and higher and by the late 60s had blocked our view. Between us and the tip, until it got covered up, was an the old dynamite magazine. The building was a tall concrete bunker with a gable roof still surrounded by parts of its security fence. This was one of our many playgrounds, and it was surrounded by many old cars that were being dumped. We smashed car windows, jumped on bonnets and made sure they were wrecked. Gradually the rubbish buried them. Imagine the money these cars would be worth today. My brother Ian discovered there was good money in scrap copper and he spent many hours at the tip scrounging and bringing home old cable which dad would put in a drum to melt off the plastic. This was saved up for when we visited Dad's sister Molly in Sunshine. The scrap metal dealers gave much more than Bendigo. Ian used his money to buy tape-recorders and build up a collection of '45' records and transistor radios. Directly opposite us was a dam from which an underground pipe went under Belle Vue Road and supplied the State Crusher-Battery. The battery is still there today but the outer metal shell has replaced the old weatherboards and gabled roof. The dam was a great spot for catching yabbies which we would bring home and boil up on the wood stove in pot for lunch. Next to the dam were the two 'caves'; 200 metre long tunnels bored in under the 'Blue Hill'. With our candles we spent many hours here. The right-hand tunnel had a bend half-way down and it was completely dark after this, also there was a small room cut into the rocks just around the bend. We often dragged 'Chinese Scrub' down the tunnels and lit it up; just to watch the smoke come billowing out of the entrance. Refer to the maps below and also the article on my Grand-parents (Lisle) House. 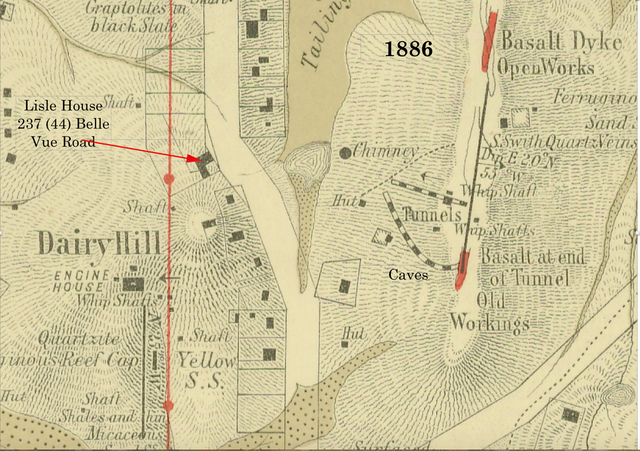 The 'Blue Hill' (Quartz Hill) (Shown on the map above are the caves ansd the Basalt Open Works) was my favourite playground. Alas today it is fenced of and most of it levelled on top. It is part of the Bendigo Council Depot. It had on top which I can only describe as an open-cut mine, about 2-3 metres deep. There was also other small caves cut into it sides. Right on the peak of the hill there was another cave, which we always thought connected to the tunnels; but the entrance was about 2 metres deep. We climbed in a few times to the entrance but were always too scared to go any further. Growing up in Bendigo, we were made well aware of open mine shafts and where they were; so had a great respect for the unknown. Just over the top of the hill on the Adams Road side was a huge hole which had big peppercorn trees growing out of it. I remember what seemed like hundreds of magpies roaming around here. The soil all around was red clay which much to Mum's disgust would get stuck all over your shoes when it rained. In the rain we puddled around in the gullies amongst the golden wattles and Chinese Scrub, and built dams with 'steel can spillways' across the run-off water. If you weren't careful you would get stuck in the clay up over your ankles. Every Guy Fawkes night my brother and I would pull out a heap of chinese scrub and build a huge bonfire on the crown land at the rear of the house. Crackers and fireworks were all the go. We took great delight in blowing up the neighbours letter-boxes each November; and any huge red meat-ant nest was fair game. Most Saturday’s I would walk to Golden Square and take the tram to the city for the matinees; either at the Plaza or Lyric Theatre. My Saturday allowance was around two shillings (20 cents). This was usually enough for a return tram fare, admission upstairs and lollies at interval. If you ate too many lollies and didn’t have the fare home; you often walked the mile home from the city. During the football season we would walk to the Wade Street ground at Golden Square with our Grand-mother to watch the Bulldogs take on their opponents. If the football was in the city or out at Eaglehawk, we all walked 'down the Square' and got on the tram. In the late 60s when I got my licence, I was allowed to drive my Grandmother to the opposition grounds at Rochester or Castlemaine. After Gravel Hill I spent years 4, 5 and 6 at Golden Square State School in Laurel Street. They worked out I wasn’t ‘slow’ but short-sighted and thus began my lifelong battle with myopia. The teachers I had in those days were exceptional, Mr McConville and Mr Hawk. It was all about stories, history and poetry and I looked forward to story times in the afternoons. We made nice leather bank-book holders during craft-work, and sewed patterns on linen tea-towels. I often wish I had kept working with leather goods. Being close to the Golden Square shops, most days you bought chips and potato cakes at the Fish Shop. I remember each lunch time standing in rows six deep waiting to be served and for your order to cook. Parents today would be horrified at this junk food diet, let alone you could roam the streets in safety. In 1963 I started in form 1 at the Golden Square High School. We were only the second intake at the new school. There was a lot of bullying in those days especially from some of the girls. I found out later that the poor kids that were bused in from outlying area such as Marong were a lot worse off for the effect of bullying. I guess I got away from most of it but not without some scars. Years later one of the girls who had become a school teacher I met at a reunion. She apologised to me about the hard time she gave me. What else do 60 year olds talk about? Not long after that she passed away. Being relatively quiet I kept most things to myself. One year the school organised a truck load of hay to take us out to an end of year party at Bridgewater. A cold wet night and the tarp over the top; I was off for a week with Asthma. Neither my fellow pupils or the teachers had any idea how I suffered. The product Ventolin did not exist and the drugs I took would send me on a trip for one or two days afterwards. Most things seemd in slow motion. The night after the attacks I have never slept so soundly since. I took these for another 14 years before my life started to change with the introduction of Ventolin. Nether-the-less I did enjoy the cross country runs at school and even though I puffed and wheezed over the 5 mile course it give give me satisfaction to complete the course. The cross country course covered the area we frequented on the weekends so I knew the terrain and any shortcuts I could take; and I knew the last mile was all down hill through the bush from Diamond Hill. One day I ran past a couple of kids from a lower form. Much to my surprise they cheered me on. I was astounded; I think this was the first time any of my peers had encouraged me and expressed their respect. Later on around 1968 I was introduced to Volleyball and this was to have a great impact on me and influence for the next 22 years. I met my wife through Volleyball, became a referee at the national level and State Tournament Director. 40 years later I was rewarded with a life-membership from Volleyball Victoria. Another thing that had a great influence on me was when I became a prefect, not once but twice, due to the fact that I had to repeat Form 6. This taught me the beginning of leadership skills. Also, still quiet, I found the ideal job at school socials was to get behind and man the soft drink stalls. This way I didn’t have to dance with anyone; or to worry about not dancing. It kept me busy. Living so close to school was a bonus, I could easily go home for lunch during the break. In the early years I would walk home and my mother would often drive me back just in time for the afternoon. Later on I found I could ride my bike to and from a lot faster. My clearest memory at school was the hot Winter's day in July 1969 when we were all jammed in to a class room to watch Neil Armstrong walk on the moon.